What was the best bit about the Olympics then? The Lightning Bolt making history? Jess Ennis as one of the nicest athlete goddesses ever? Catherine Grainger finally getting her Gold? George Michael’s dad-dancing? (Er.. Maybe not that). The metamorphosis of a dreaded ‘Public Project’ wrapped in our traditional dour British cloak of weary cynicism and complaints about cost, into a sparkling spectacle of pride and warmth that seemed to touch all but the hardest of hearts, was enlightening and uplifting. From a design point of view, it was also interesting. The jaw-dropping sporting endeavours, achievements and (critically), back-stories were of course at the heart of the magnetism of the event that took many of us by surprise. But its effect on us also had much to do with the ‘envelope’ – the overall, designed, ‘Olympic Brand Experience’ that swept a nation, and much of the world, along with its flow. We became irrationally emotionally engaged with the whole Olympic spectacle. We lost our cold, judgemental, sensible selves for a while. And, of course, we loved doing so. Design and creative expression played a huge role in all this. Great experience design has the potential to create wonder. And we yearn for wonder. We want to be wowed. This is nothing to do with anything rational – but human beings are infinitely less rational than we would like to believe. The fact the Olympic logo was so badly received; yet the Olympic experience was such a success, indicates how a brand is so much more than a badge. One particular moment of transformation seemed to tip most of us into love with the Olympics and make us realise we really were in for The Greatest Show on Earth. The centrepiece – the main stadium itself – always looked a bit average.. dull.. Public.. British. Then, suddenly, at the opening ceremony it staged a beautiful dissolve between hard architecture, people, light and movement that took the breath away. Sweeping visual symphonies of light, colour and images played across the whole crowd as we witnessed the liberation of the pixel. The world’s biggest, most immersive digital image created by tens of thousands of little LED lollipops, one in front of every person in the stands. 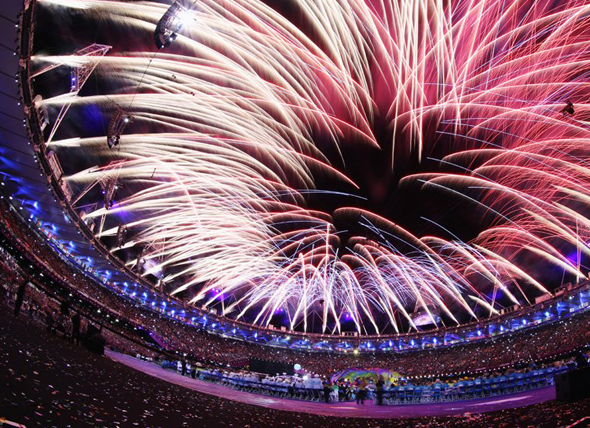 This swirling digital tapestry was a backdrop for Danny Boyle’s theatrical showmanship, Thomas Heatherwick’s surprising, flaming kinetic sculpture and many more designed delights that had almost nothing to do with sport; and everything to do dazzle and glitter. Without it, the Olympics would be a global sports contest, but no more than that. What seemed beforehand indulgent, superfluous, extravagance, was in fact essential. So the best moment of the Olympics? When the investment in ‘wonder’ was suddenly worth it. Pete Champion is Group Partner & Director of 3D Design at I-AM.